COSTA MESA, Calif. (Feb. 7, 2019) – The OC Running Festival, a world-class, three-day event that attracts more than 23,000 participants from 46 states and 22 countries, today announces that San Diego County Credit Union® (SDCCU®) will return as title sponsor for the 2019 OC Marathon. 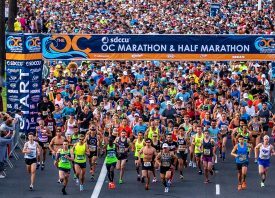 The OC Running Festival, now in its 15th year, also features the OC Half Marathon, OC 5k, OC Music Festival, the Kids Run the OC “Final Mile” and the OC Lifestyle and Fitness Expo. To register for the races, or for more information about how to get involved including corporate sponsorships, visit www.ocmarathon.com, @OCMarathon, or email info@ocmarathon.com.